Star of EastEnders and Gavin & Stacey, Larry Lamb headlines as the villainous Abanazar in this year’s magical pantomime Aladdin at the Ashcroft Theatre, Fairfield Halls, Croydon from Friday 2nd December until Friday 2nd January 2012. 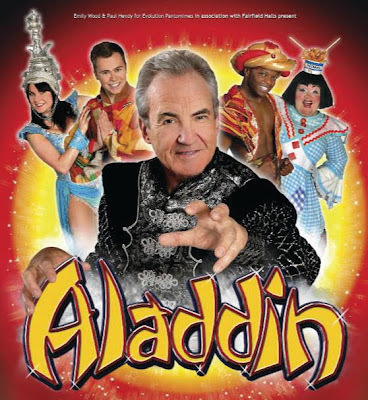 Fairfield Halls is delighted to announce a new producing partnership with acclaimed pantomime company Evolution Pantomimes, renowned for their superb family entertainment, who present this year’s pantomime treat for the first time at the Ashcroft Theatre, Croydon. Antony Hansen, fresh from a West End run in the hit musical Wicked plays the role of Aladdin, with Joe Tracini, who recently joined the cast of Hollyoaks and appeared in the BBC3 comedy Coming of Age, as Wishee Washee. Quinn Patrick is the outrageous dame Widow Twankey in charge of the Chinese laundry, Nathaniel Morrison the magnificent Genie of the Lamp and Kelly Chinery the Genie of the Ring. 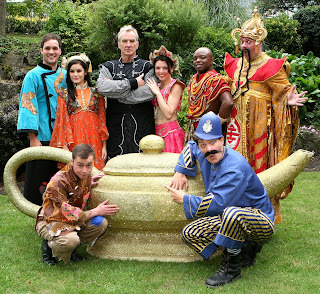 The beautiful Princess Jasmine is played by Rosa O’Reilly, closely guarded by the Chinese Policeman Oliver Broad. Paul Tate appears in a majestic role as The Emperor, and also directs the pantomime. Colourful sets, spectacular costumes, fantastic effects, lots of fun, laughter, great music song and dance, not forgetting plenty of audience participation, make this a spectacular panto not to be missed! Larry Lamb is known to millions for his roles in BBC TV’s award-winning comedy series Gavin & Stacey, as Mick Shipman (Gavin’s Father), and as rogue Archie Mitchell in the hit soap EastEnders. The public voted Larry Villain of the Year at the 2010 British Soap Awards for his portrayal of Archie with EastEnders also receiving the Best Storyline Award for Who Killed Archie? Larry has recently added author to his extensive acting career, which includes a wealth of credits embracing television, film and theatre, and is currently enjoying success with his first book Mummy’s Boy: My Autobiography.